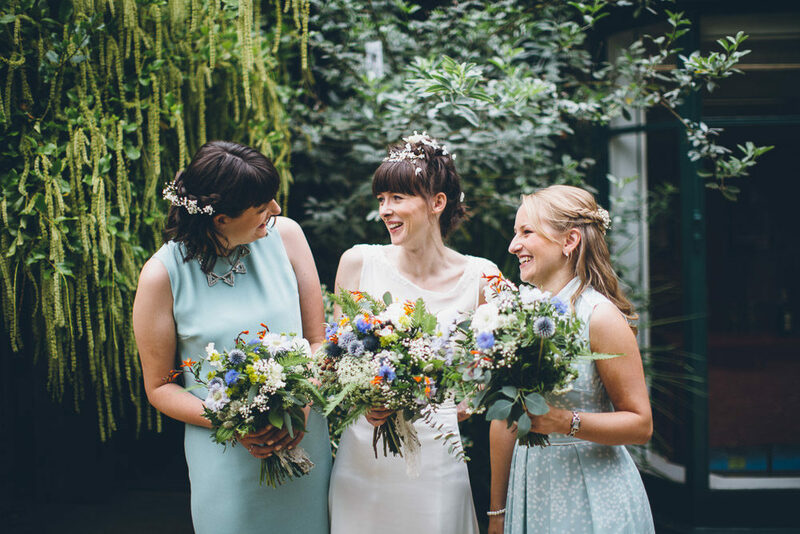 Right then who’s up for a Manchester based wedding with a botanicals theme and a super cute bride and groom? All of you? Thought so…good job we’ve got Gemma and Steven’s glorious big day for you then isn’t it. 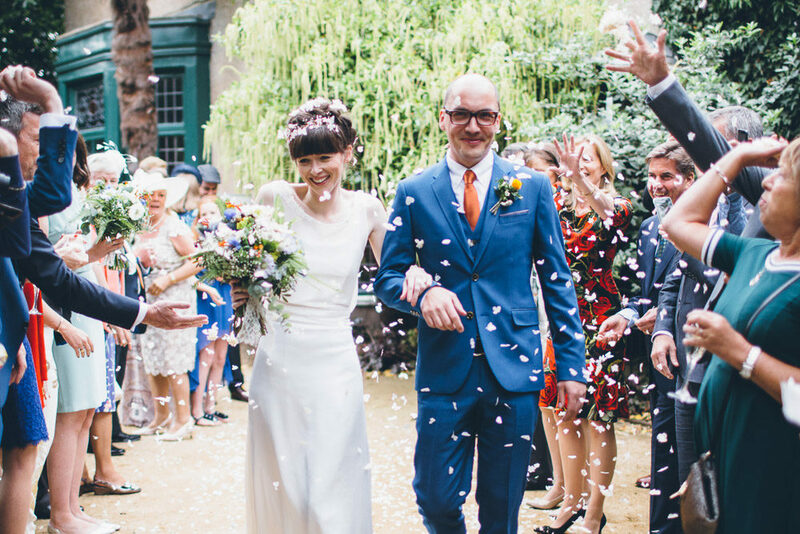 The pair decided to say their ‘I DOs’ at The Old Parsonage amongst beautiful gardens before moving on to the more industrial Islington Mill for the party. I am particularly in love with the amazing florals created by David at Frog Flowers; all of the action was captured by the talented Mike Plunkett. 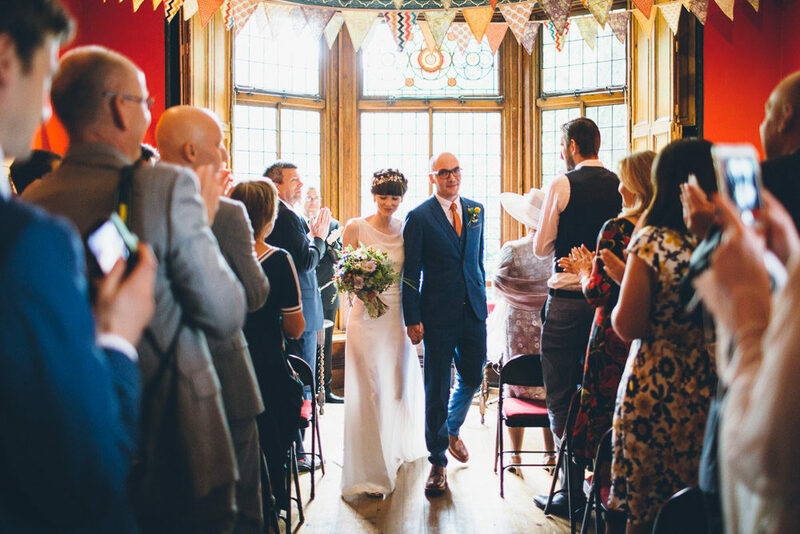 Gemma The Bride: I knew I wanted something simple and elegant, with classic lines and lace. I met my dress designer Claire Amelia at a vintage wedding fair in Harrogate and I decided to go with her as she seemed to really understand what I was after and I liked the idea of supporting a very talented British designer. 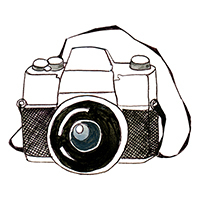 It was a great experience and more fun than I ever imagined and I was so pleased with the result. I love the back of the dress the most with the lace bodice showing through the draped material. I didn’t want to wear a veil but I wanted a headpiece that would highlight the pattern on the lace. I didn’t want to spend a fortune on one so trawled through Etsy and found the perfect piece. My make up was applied by Rebecca Anderson; I wanted to look like me so went for a natural English Rose look! Hair was primped and preened by Adam Bryant from Ethos. Adam has been doing my hair for about seven years and he put up with me changing my mind about what kind of braid I wanted about five times! Steven wanted a balance between a classic three-piece suit, but with a modern cut and fit which he found at Ted Baker. He wanted a colour that would stand out, without being too crazy and something comfortable that he would be able to wear in the future. He treated himself to some Grenson shoes. The tie was the hardest thing to find – apparently orange ties were not in fashion in August 2015! We knew it was going to be in Manchester, there wasn’t even a discussion about it. 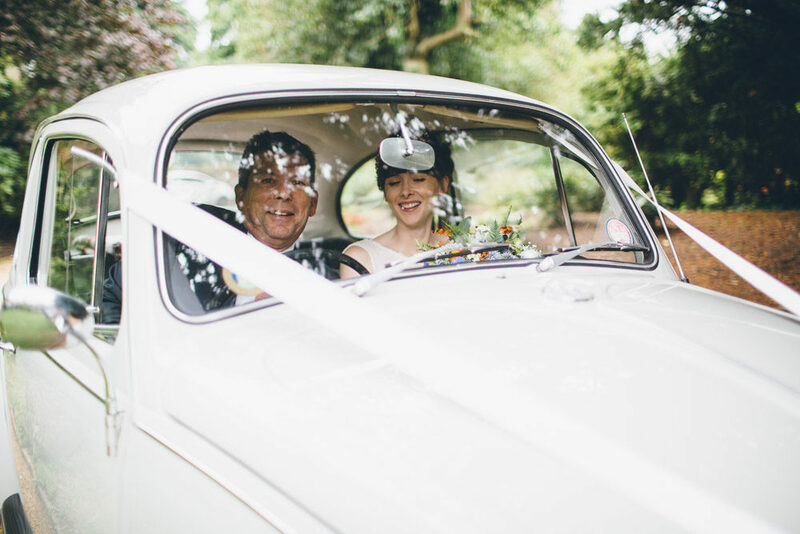 We also knew that we didn’t want to be tied in with a venue package and have to use certain caterers and have to pay a fortune in corkage and generally didn’t want to be ripped off – so a separate ceremony and reception venue was the only way forward. 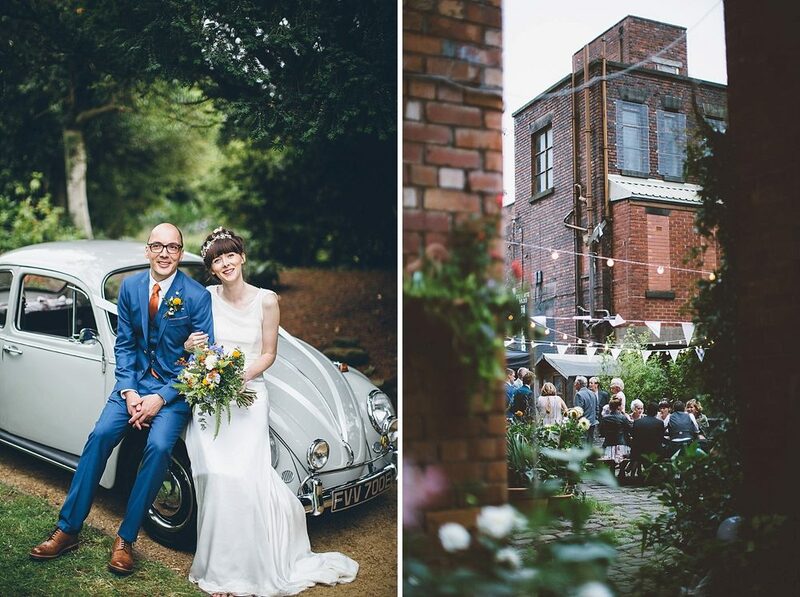 The Old Parsonage is a beautiful old house in Didsbury, set in beautiful gardens, so you feel like you’re in the countryside, this gave us a lovely traditional feel to proceedings. Also they were really flexible; we didn’t want to pay for a caterer to come in for a drinks reception so we bought our own prosecco, got some canapes from M&S and hired some friends to run it all. Islington Mill offered us so much flexibility – they would basically let us do whatever we wanted, again it’s a really interesting location, an arts space used for exhibitions and gigs, a lovely courtyard and brilliant sound system. We thought it the perfect place to have a party! Steven designed and built a lot of the stuff for our wedding, including all the invites, menus etc. 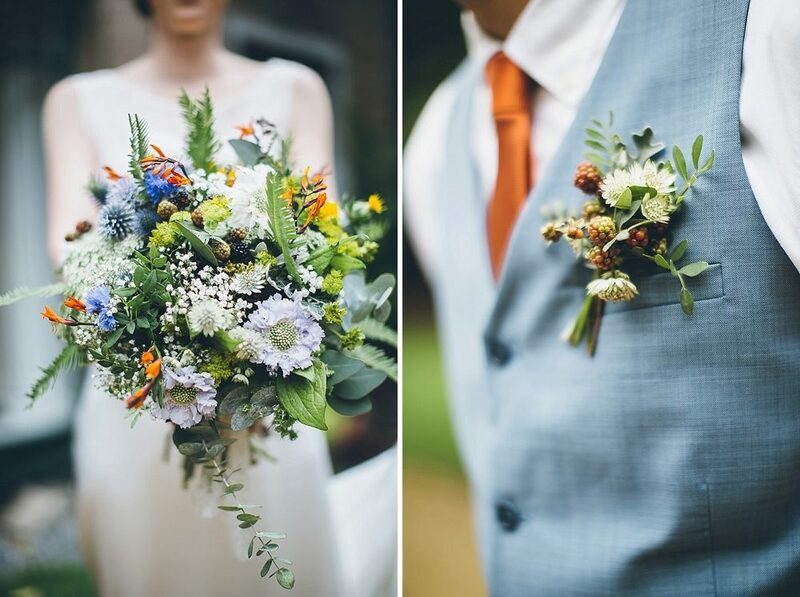 We went for a botanical theme, inspired by the gardens at The Old Parsonage. He really excelled himself by building a large S & G marquee sign that looked amazing. We knew Islington Mill would need some colour, as a converted mill it still feels very industrial and we wanted to soften the edges. So we went for oranges and blues, something that would bring some of the late summer to the concrete pillars, floors and ceilings of the mill and would also fit with the gardens of The Old Parsonage. We were extremely lucky to have an army of friends who gave up hours of their time to help us make hundreds of pom poms to hang from the mill ceiling and it was really worth it. Along with hundreds of fairy lights and flowers the mill looked unrecognisable. 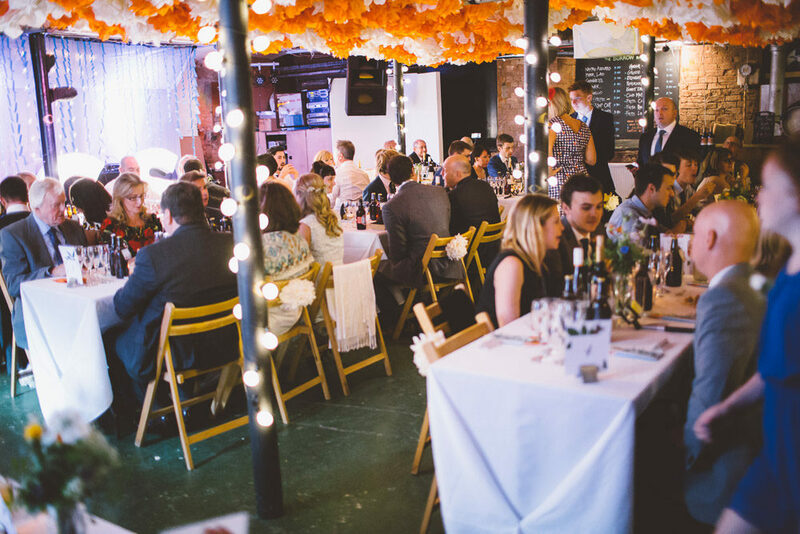 We kept things simple with trestle tables, wooden chairs and as we were having street food we sourced some good disposable cutlery to keep with the theme. David at Frog Flowers is amazing, he should be considered an artist. Our thinking was to have something quite wild and relaxed/unstructured – imagining urban wastelands and the flowers that start to grow on them and he surpassed anything we could have expected. We had a couple of readings at our wedding – Roger McGoughs ‘Vow’ read by Steven’s childhood friend Richard and ‘This Much I do Remember’ by Billy Collins read by Gemma’s brother Phil. We didn’t want anything over the top so the Billy Collins poem was perfect, not something I’ve heard at other weddings and really described how it’s our everyday life together that we really love and remembering to appreciate the small moments you have together. 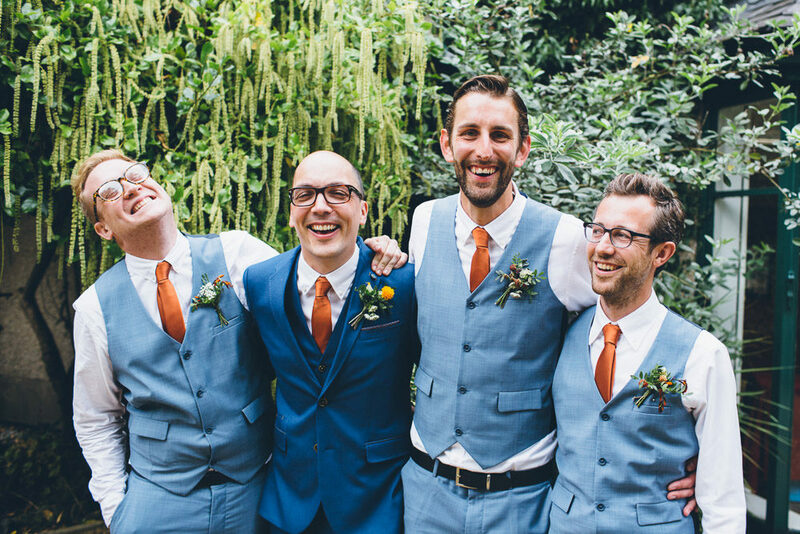 Also everyone had a good laugh when Steven jumped in before the registrar was finished to say ‘I do’. 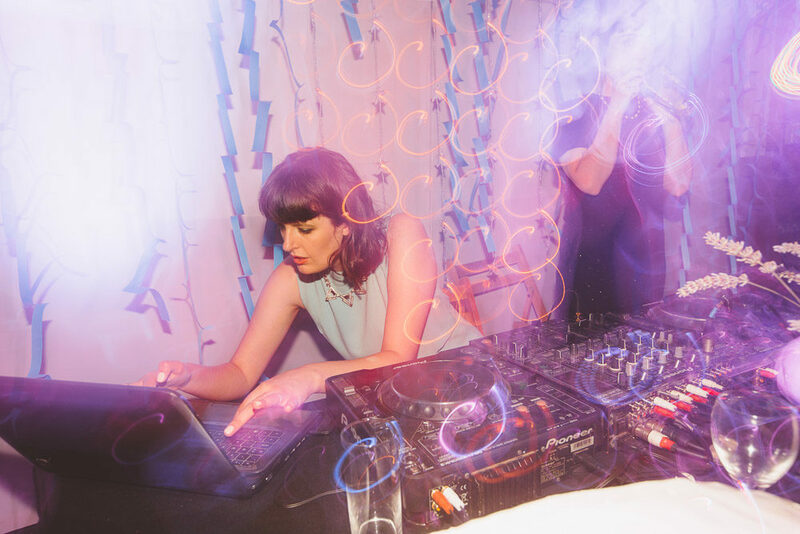 We’re lucky to have friends who either have very good music taste or who are actually DJs. Particular highlight was Gareth Brooks who got everyone on the dancefloor for a solid hour despite it being about 30 degrees in the room – no one could leave because it was just hit after hit. The night ended with Duncan from the band Dutch Uncles doing an impromptu karaoke set to Travis’s Driftwood – quire unexpected! We also had a table tennis table as I love racquet sports and winning! One of the first things we decided was to have street food. We found Andy who runs Low ‘n Slow on Twitter and his food and recommendations meant he was our first choice. We had tasting boxed with chili brisket, pulled pork, coleslaw, bbq beans. Everyone had to go outside to queue up in the courtyard and came back with food in cardboard boxes. There were a lot of people going back for seconds. He also provided the evening food – BLTs. For desert we had Ginger’s Comfort Emporium who are very well known in Manchester for producing the best ever ice cream. The cake was made by a friend of a friend and was three tiers. The top tier was gluten free Lemon and Thyme (I am gluten intolerant and it was the best ever gluten free cake), the middle was Coconut and Lime and the bottom, classic Victoria Sponge which is Steven’s favourite. For wedding favours Steven decided to brew his own beer. He really enjoyed the process and it’s now become a fully-fledged hobby. We chose Mike Plunkett, firstly because he takes beautiful photos and seems to really capture the atmosphere of the day and secondly because he is a friend. He was great, and the photos are so special, the thing I like most about them is they seem to capture the tender moments but also how much laughter there was as well.